Chang KW. 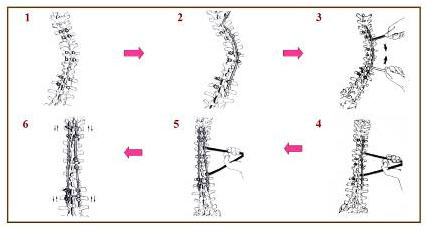 Cantilever bending technique for treatment of large and rigid scoliosis.Spine 2003;28:2452-48. Kao-Wha Chang. Cantilever Bending Technique for Treatment of Large and Rigid Scoliosis. Spine 2003;28:2452-58. Yan Wang, Yongguang Zhang, Xuesong Zhang, et Al. A Single Posterior Approach for Multilevel Modifier Vertebral Column Resection in Adults with Severe Rigid Congenital Kyphoscoliosis. Eur Spine,17(3)361-72,2008. 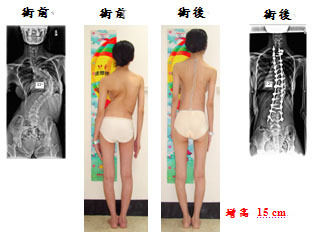 Koptan W, Elmiligui Y. Three-Stage Correction of Severe Rigid Idiopathic Scoliosis Using Limited Halo-Gravity Traction. Eur Spine J. 2011 Dec 13. DOI 10.1007/s00586-011-2111-0. Scott J. Luhmann, Lawrence G. Lenke, Yongjung J. Kim, et al. Financial analysis of circumferential fusion versus posterior-only with thoracic pedicle screw constructs for main thoracic idiopathic curves between70° and 100°. J Child Orthop. 2008 March; 2(2): 105-112. Viola Bullmann, Henry F. H. Halm, Tobias Schulte, et al. Combined Anterior and Posterior Instrumentation in Severe and Rigid Idiopathic Scoliosis. Eur Spine J (2006)15:440-448. Kao-Wha Chang. Cantilever Bending Technique for Treatment of Large and Rigid Scoliosis. Spine 2003;28:2452-2458. Arlet V, Jiang L, Ouellet J. Is There a Need for Anterior Release for 70-90 Degrees Thoracic Curves in Adolescent Scoliosis? Eur Spine J. 2004 Dec;13(8):740-5. Epub 2004 Dec 22. Weal Koptan and Yasser Elmiligui. Surgical Correction of Severe Dystrophic Neurofibromastosis Scoliosis: an Experience of 32 Cases. Eur Spine J. 2010 September; 19(9): 1569-1575. Yan Wang, Guoquan Zheng, Xuesong Zhang, et al. Comparative Analysis Between Shape Memory Alloy-Based Correction and Traditional Correction Technique in Pedicle Screws Constructs for Treating Severe Scoliosis. Eur Spine J. 2010 March; 19(3): 394-399. Matthew B. Dobbs, Lawrence G. Lenke, Yongjung J. Kim, et al. Anterior/Posterior Spinal Instrumentation Versus Posterior Instrumentation Alone for the Treatment of Adolescent Idiopathic Scoliotic Curves More Than 90°. Spine 2006;31:2386-2391. Scott J. Luhmann, Lawrence G. Lenke, Yongjung J. Kim, et al. Thoracic Adolescent Idiopathic Scoliosis Curves Between 70° and 100°. Spine 2005;30:2061-2067. Scott J. Luhmann, Lawrence G. Lenke, Yongjung J. Kim, et al. Thoracic Adolescent Idiopathic Scoliosis Curves Between 70° and 100. Spine 2005 Sep 15;30(18):2061-7.